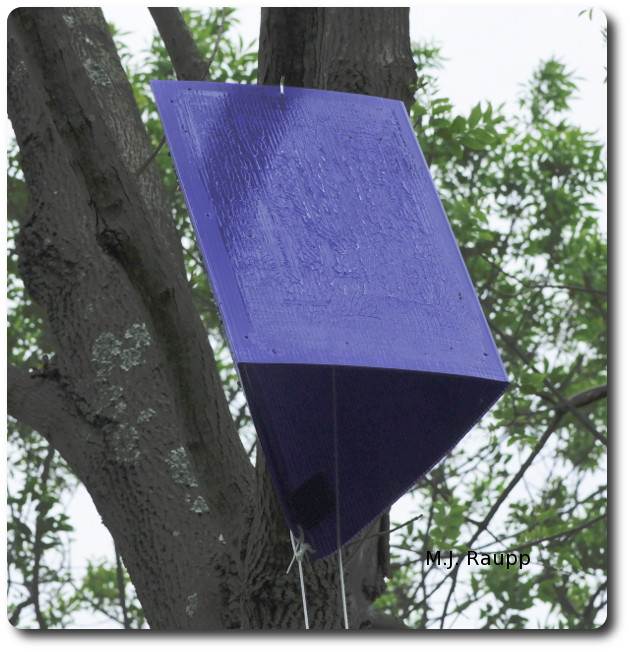 Purple Barney traps hung in trees throughout Maryland will help state officials and researchers learn where EAB is and how rapidly it is spreading. A previous episode of Bug of the Week examined the quest to locate and eradicate the dreaded Green Menace, the Emerald Ash Borer (EAB) as its reign of terror expanded in Maryland. This invasive beetle attacks and kills all known species on North American ash. Ash is a rather common native tree and several species border rivers in the lowland and piedmont areas of our state where they provide shade, habitat for wildlife, and nutrients to our woodlands and small streams. Ash is also a common resident in cities and suburbs where it brings beauty and cools our streets, lawns, and parks. For example, ash is the most common street tree in Baltimore comprising more than 10% of the total street tree population. If Baltimore’s suburban counties are added to the mix, there may be as many as six million ashes in and around the city. Tiny Oobius agrili lays her eggs in the eggs of EAB. Photo Credit: Debbie Miller, USDA FS. EAB was first detected in the United States near Detroit, Michigan in 2002 and it has now spread to thirteen states and two provinces in Canada. EAB likely arrived in this country in packing material from Asia and it was transported to Maryland from Michigan with infested nursery stock. To date, EAB has killed more than 40 million ash trees and it now threatens several billion nationwide. Since 2003 officials from the Maryland Department of Agriculture in cooperation with the USDA have conducted search and destroy missions in an attempt to eradicate the beetle from the forests of Maryland in Prince George’s County were it was first discovered. Unfortunately, the wily beetle has managed to stay one-step ahead of officials and in 2008 it jumped the southern border of Prince George’s County into northern Charles County. Between 2003 and 2009 more than 40,000 ash trees distributed over 17,000 acres have been removed and destroyed. To track the spread of EAB, the Maryland Department of Agriculture in cooperation with USDA has established a statewide trapping program that relies on a triangular sticky trap hung in trees. This trap is tinted the color of the affable purple dinosaur Barney and has been affectionately dubbed the “Barney” trap. Beetles are attracted to the color purple and they alight on traps where they are ensnared in sticky goo. Several thousand Barney traps are established throughout Maryland and will be checked from May until August. In addition to monitoring the movement of this nefarious pest, the Maryland Department of Agriculture and USDA began releasing biological control agents of EAB in 2009. Three species of natural born EAB killers,Oobius agrili, Tetrastichus planipennisi, and Spathius agrili, were discovered and brought from their aboriginal home in Asia to the United States. The hope is that these small wasps will become established in the US and reduce populations of EAB to levels far less damaging than ones we experience today. Tiny Oobius females seek eggs of EAB on the bark of trees and deposit their own eggs within. Eggs hatch and the developing larvae of the wasp consume the eggs of EAB. Each female Oobius can kill more than 60 eggs of EAB.Tetrastichus uses her remarkably clever egg-laying appendage called an ovipositor to locate an EAB larva under the bark of the tree. She bores through the bark, lays eggs inside the EAB larva, and her eggs hatch into small grub-like larvae that devour the beetle from the inside out. More than 120 of these endoparasites can emerge from a single larva of EAB. Spathiusfemales also drill through the bark with their ovipositor and lay about 20 eggs on the skin of the EAB. 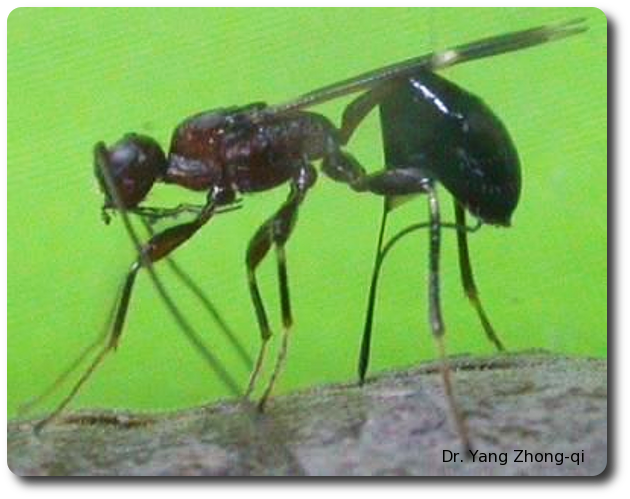 The parasitoids hatch and feed externally through the skin as ectoparasites, killing the pest as they develop. Both Tetrastichus and Spathius complete several generations each year. The approach of importing agents of biological control from a pest’s native range and releasing them in the new land is called classical biological control. This approach has been remarkably successful in helping reduce damage caused by other forest pests, including gypsy moth in our region and ash whitefly in the west. Like humans in Tolkien’s epic tales of hobbits battling evil, many people are placing their hope in three small wasps to end the threat of the Green Menace. I have received phone calls from concerned citizens wanting to know if their ash trees are infested with EAB. Like a crime scene investigator, you can use clues called symptoms and signs to determine if EAB is attacking your ash tree. The following link will take you to a web site called CSI for EAB that has a step-by-step guide to identifying pests attacking your ash: http://www.dnr.state.md.us/forests/forester/eab.asp.